Investors in the week ahead will receive updates on Colombia’s economy, including industrial production and retail sales, amid continued risk appetite in many emerging market countries. Colombia, as with most nations, has been contending with slowing global growth, albeit with an upside to financial conditions as central bank monetary policy remains accommodative. At its latest monetary policy meeting in late March, the Banco de la República elected to maintain its benchmark interest rate at 4.25%, a level they considered “moderately expansionist.”. Meanwhile, the recent course of monetary policy in the U.S. has generally stoked investors’ fervor for riskier assets. The Banco de la República, Colombia’s central bank, anticipates average growth for its trading partners in 2019 to come in at around 2.3% -- “somewhat lower this year than in 2018.” However, it noted that international financial conditions should be more favorable for emerging economies than those considered in its previous report. According to Fitch Solutions, Colombia's central bank will likely hold its benchmark interest rate steady in the coming months before beginning a rate-hiking cycle in the second half of 2019. Fitch expects the central bank will commit to its accommodative policy stance in the short-term to support economic activity absent upside pressure on prices. They added that they think Colombia’s benchmark interest rate will end 2019 and 2020 at 4.75% and 5.00%, respectively, with inflation averaging 3.4% year-on-year in 2019 and 3.3% in 2020. The Federal Reserve’s decisions to maintain the target range for the federal funds rate at 2.25-2.5%, with no plans in 2019 to hike interest rates further, as well as cease other quantitative tightening measures, had spurred a plunge in government bond yields, which effectively helped to reignite a decent degree of risk appetite. 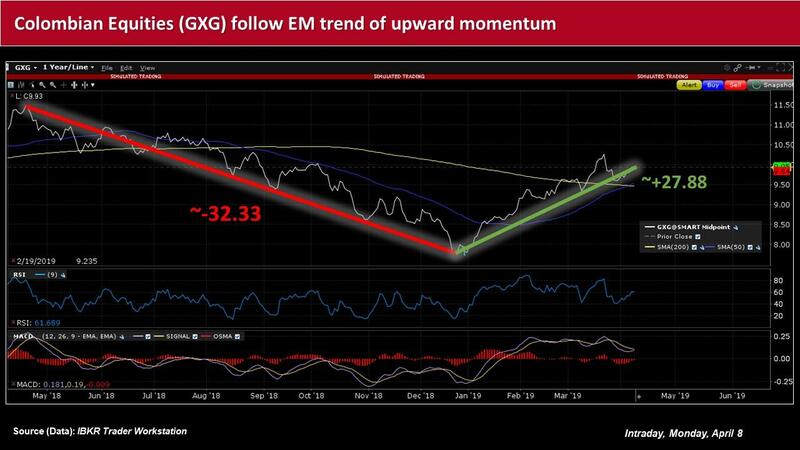 Colombian stocks have been no exception, with the Global X MSCI Colombia ETF (NYSEARCA: GXG), which has among its top holdings Bancolombia (NYSE: CIB) and oil giant Ecopetrol (NYSE: EC), having risen by nearly 28% from its most recent 52-week low set in late December 2018. Sentiment about the country’s ability to honor its debt obligations has also been positive, as suggested by a more than 19bp tightening in its five-year credit default swap (CDS) spreads over the past three months. Colombia’s sovereign CDS stood at around 107.5bps intraday Monday, according to Bloomberg. Against this backdrop, market participants ahead of the weekend are set to receive fresh figures on Colombia retail sales, as well as manufacturing production. 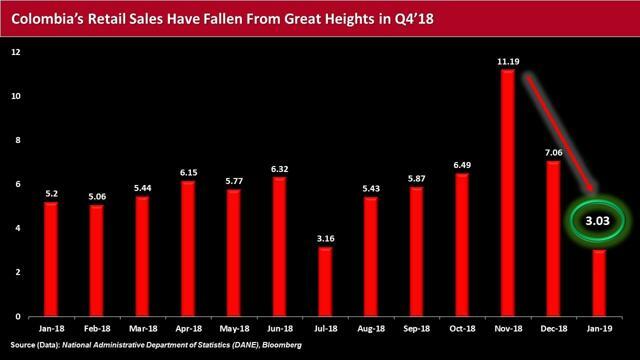 According to the country’s National Administrative Department of Statistics (DANE), retail sales in January rose 3.0% year-on-year – a steep decline from 7.1% in the prior month and well-below November’s height of 11.2%. Of the 16 merchandise lines, 12 registered gains, including alcohol and tobacco, cleaning goods, and personal electronics. Meanwhile, Colombia’s manufacturing sector in March had undergone further deterioration, amid an acceleration in the contraction of new work, as well as renewed workforce reductions. Business conditions worsened, in line with the year-to-date trend, falling to 48.9 from 49.5 in February, according to the seasonally adjusted Davivienda Colombia Manufacturing PMI. Moreover, at 49.0, the average quarterly reading for the first quarter was the lowest since the final quarter of 2017. Andrés Langebaek Rueda, Davivienda’s chief economist of the Bolivar Group, said that if “we discount the ups and downs that occur every month” in the figures produced by DANE, “manufacturing production has been losing momentum. Investors will likely be keeping an eye on Colombia’s manufacturing sector, as well as the levels of external and internal demand factors, as slowing global growth – and any other number of headwinds – could pose adverse impacts to the country’s overall economic health. Note: This material was originally published on IBKR Traders' Insight on April 8, 2019.